Lean Body For Her Instant Toning Nutrition is the meal replacement shake designed especially for women. It provides female athletes with a concentrated source of protein and essential nutrients in an easy-to-use, delicious shake, formulated to fit a women's nutritional needs. It mixes instantly without a blender, and its low-sugar formula is ideal for carb-restricted diets. Lean Body For Her is for women of all ages who desire to tone lean muscle, burn unwanted fat and reduce inches from their hips, thighs, and buttocks. Lean Body For Her works best when used in conjunction with a low calorie diet and exercise. Lean Body For Her is a unique meal replacement powder formulated specifically for women’s nutritional needs. It is high in the nutrients that an active woman needs to get into great shape and achieve optimum health. Lean Body For Her comes in convenient, serving size packets that fit easily into your purse, briefcase, or gym bag. Whenever you want a fast, delicious and nutritious meal or snack, just tear open the packet and mix with cold water, skim milk, or juice. 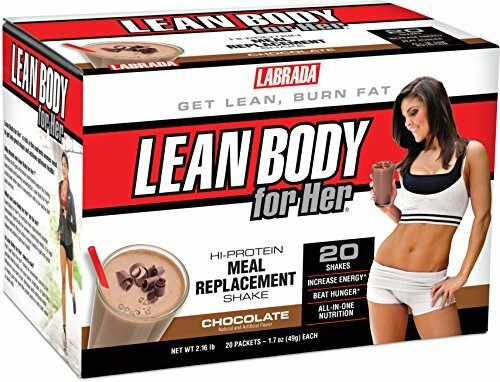 Lean Body For Her should be used twice per day as a meal replacement or as a treat in between meals. Lean Body For Her contains a combination of healthy ingredients that work together synergistically to provide nutritional support for lean muscle tissue and increasing energy.